Bella, an eleven-year-old Shepherd mix, was killed by her caregiver on December 23, 2016 in Long Island, New York. He tightened a zip tie around her neck, stuffed her in a garbage bag, and beat her with a metal shovel. 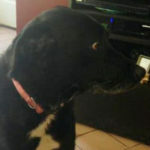 Due to the extent of her injuries, Bella had to be euthanized. 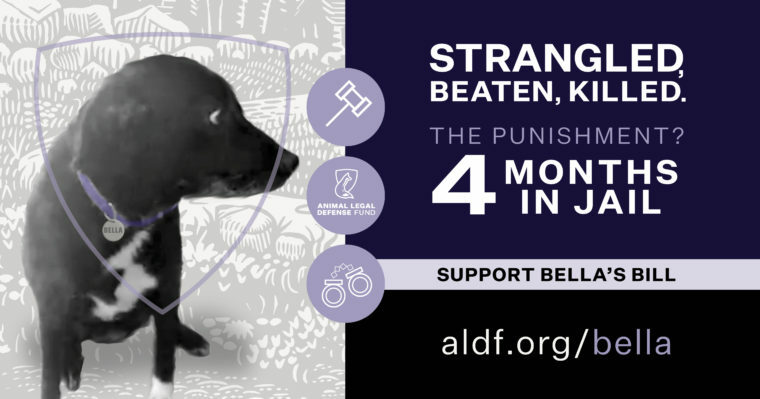 Despite the seriousness of the crime, Bella’s abuser received only four months in county jail – that’s not justice. New York ranked in the bottom half of states in the Animal Legal Defense Fund’s most recent U.S. Animal Protection Laws Rankings Report. Current law only allows abusers to serve a maximum of two years in jail – no matter how egregious the crime. 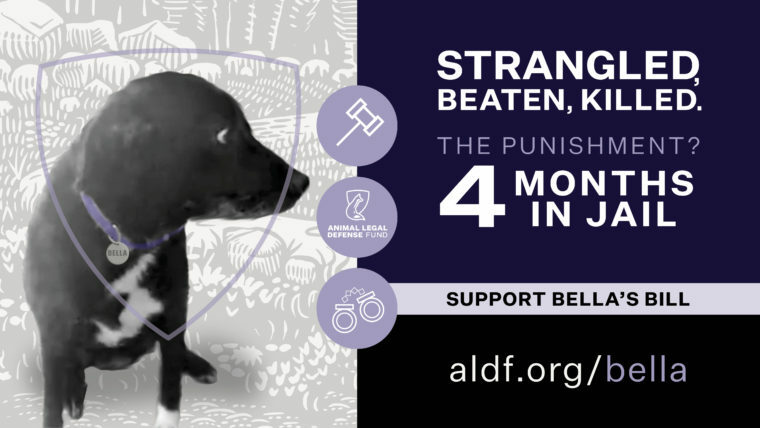 That’s why the Animal Legal Defense Fund is leading a coalition to introduce Bella’s Bill in the New York legislature. Bella’s Bill would update New York’s outdated animal cruelty laws. Unfortunately, Bella’s story isn’t unique. There are many examples of animal cruelty cases in New York that involve heinous acts of violence or terrible neglect. While the judge and prosecutor may take the case seriously, they are constrained by state law. When a court has the ability to sentence an offender who takes a shovel to a neighbor’s car to more time in prison than someone who maliciously beats an animal with the same shovel, there is clearly something wrong with the law. It’s up to the legislature to make the changes that New York’s animals desperately need. 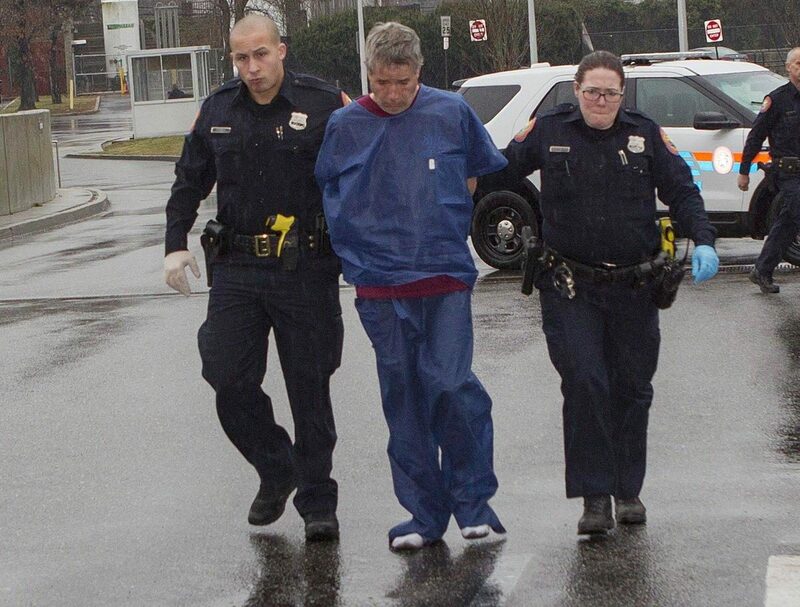 Michael Gallagher, who violently attacked Bella leading to her death. In 2018, the Animal Legal Defense Fund worked with New York State Senator Andrew Lanza and Assemblymember Linda Rosenthal to introduce S 8724 and companion bill A 10070, respectively, (both informally known as “Bella’s Bill”), to overhaul New York’s outdated animal cruelty laws. Though the bills didn’t pass, we’re already hard at work for 2019. Assemblymember Rosenthal re-introduced Bella’s Bill (A 342) in early January 2019. With your support, we can make Bella’s Bill a reality. If you live in New York, your state legislators need to know that you support strong animal cruelty laws! Sign our open letter to Governor Cuomo urging him to support Bella’s Bill. Watch this page and follow our Facebook page and Bella’s Bill Facebook page for the latest news. As the 2019 legislative session kicks into gear, we will be calling on you to contact your legislators and tell them to support Bella’s Bill. While you’re rallying support for Bella’s Bill, your fellow New Yorkers may have questions. Be prepared by reviewing these talking points that can help you explain why this legislation is so important. 1. New York’s animal cruelty laws are weak and outdated. Once a leader in animal protection – enacting the first state animal cruelty statute – New York now ranks in the bottom half of states in the Animal Legal Defense Fund’s most recent U.S. Animal Protection Laws Rankings Report. Most states, including West Virginia and Arkansas, now have stronger animal cruelty laws than New York. 2. The punishment should fit the crime. Bella’s Bill would enhance penalties for the worst animal cruelty crimes. The maximum penalty for animal abuse in New York is just two years in county jail. In practice, the sentence is often lower. New York lags behind neighboring states. In comparison, the maximum sentence for aggravated or intentional cruelty to animals is five years in prison in New Jersey and Rhode Island. In Massachusetts, New Hampshire, and Pennsylvania, the maximum sentence is 7 years in prison for willful and malicious cruelty to animals. • March 2018: A banker who stabbed his girlfriend’s dog to death and tossed the animal into a garbage chute received just 30 days in jail. • March 2018: In Staten Island, a man who tortured his neighbor’s cat and left him to die in a trash can while livestreaming it on Facebook received 15 months in jail. 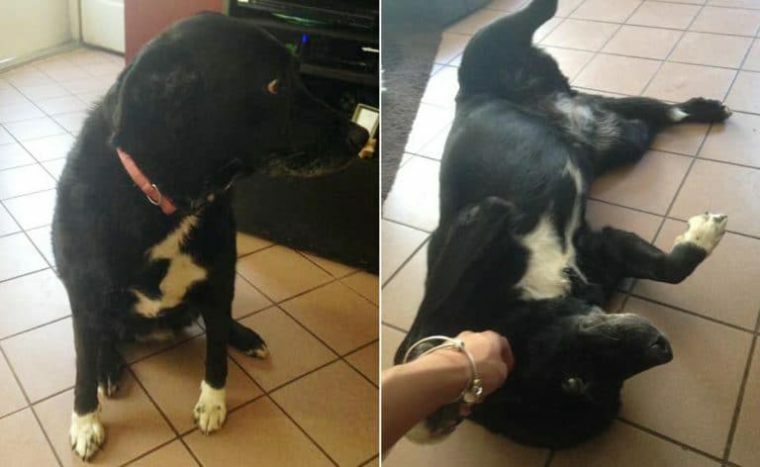 • September 2018: A man who stabbed a dog, Onyx, more than 50 times and slit his throat received one year in jail despite the prosecutor’s urging that he receive the maximum two year sentence. • September 2018: A Queens man who admitted to stabbing a cat, throwing the animal from a third-floor balcony, and then stomping him to death received 10 months in jail. 3. Abusers of animals are five times as likely to harm humans. Animal abuse is linked to violence against humans. There is a strong correlation between animal cruelty and domestic violence, as well as child abuse. As the Parkland shooting highlighted, 43% of mass school shootings involved offenders with a history of violence to animals. Taking crimes against animals seriously also protects humans, especially some of the most vulnerable members of society such as children and the elderly. 4. Bella’s Bill would make crucial changes to New York’s animal cruelty laws. Currently, animal cruelty laws are located in New York’s Agriculture & Markets Law. This is not an appropriate place to house serious crimes against animals. Other laws in this section regulate standards for grapes and ice cream manufacturers. In addition to increasing penalties for abusers, Bella’s Bill would transfer the laws into the Penal Code. This is no small detail. New York is one of only 13 states where cruelty laws are not in the Penal Code. Transferring the laws will ensure that law enforcement takes crimes against animals seriously by making training on animal cruelty laws part of police academy, requiring that key pieces of identifying information (such as fingerprints) on offenders be included in a criminal record, and requiring offenders to serve time in state prison instead of county jail. 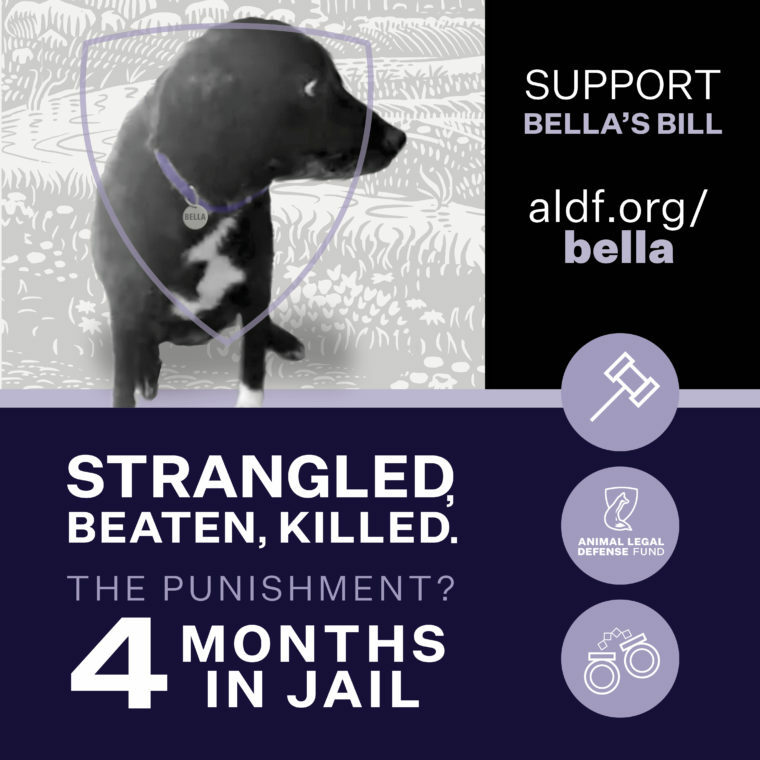 Spread the word about Bella’s Bill by downloading and posting these sharegraphics on Facebook, Instagram, and Twitter. Be sure to use the hashtag #BellasBill when posting! Stand up and be heard. Animal cruelty is a serious crime. Animal abusers are five times more likely to hurt other people. Strong sentences for abusers protect people and animals alike. Robust cruelty laws keep our communities safer for everyone.